Have you ever tried to talk to a preschool age child (or husband) during their favorite show on TV? The lack of attention can get on your nerves. Okay…I guess you caught it. I am one of those parents who allow my child to watch TV in the morning. Hey, sometimes I am tired and I need my son just to do his own thing for a few minutes while my brain wakes up. I am horrible…I won’t even talk about the fact I don’t buy organic…OH THE AGONY!!! Call the police! I digress….ANYWAY, have you ever been in a situation in which you have tried to have a serious conversation with someone only to find out more than halfway through that they didn’t hear or understand anything you have said t them. Frustrating huh? Or, like I mentioned above, have you ever been listening to someone talk and their tangents got in the way of the message? This can also be infuriating. Sometimes you just either want to clearly convey your message or you want to be heard. I think God feels the same way much of the time. There are times when I am certain that He is trying to teach me something, and because of my own pride or reluctance, He can’t get through. Not because He is powerless, but because I am distracted or I have my proverbial “fingers in my ears” and I would rather follow my own way. Well, there are many things the creator of the universe tries to say to us, and we could spend all day discussing them. Today, I want to touch on a few. 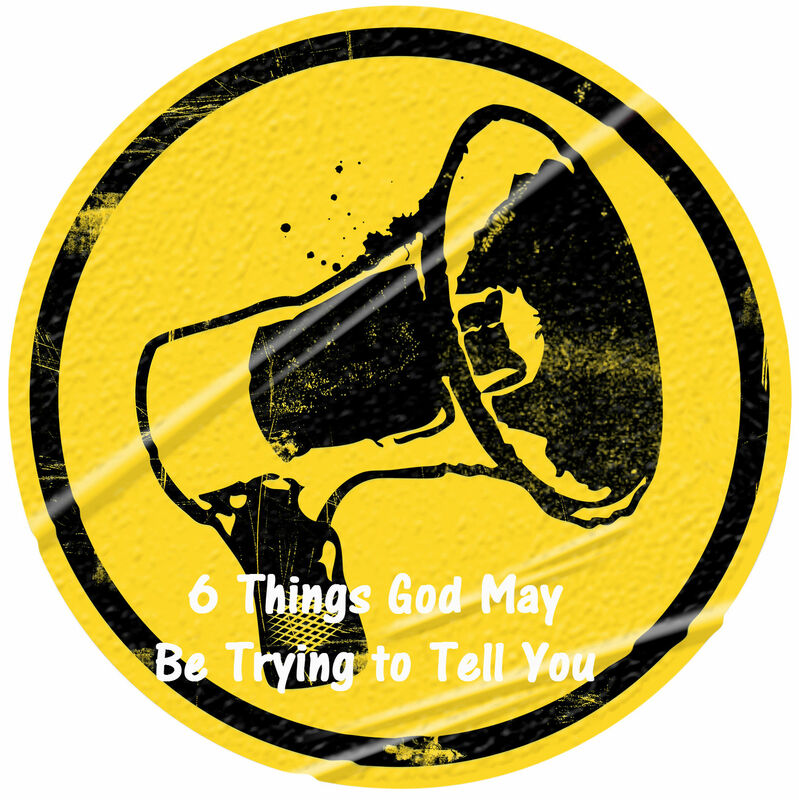 Here are 6 Things God May Be Trying to Tell You today…I think all are applicable to anyone who believes. 1. No hurt goes unheard– It is so easy to begin to believe that all our suffering is falling on deaf ears. Sometimes we can pray with such passion and for such a long time that, when we don’t see the answer or relief coming, it seems like God is ignoring our plea. When we are going through these trials, God is right there with us, suffering as well. He definitely has insight into the His own perfect plan, but I can only imagine that the reason He also suffers is because He wants to bring the solution to you right now…He just knows what is perfect. He wants the best for you, and sometimes this means we have to wait. No one likes to see their child in pain…even if we know that the pain will not last forever. 2. Sometimes the answer is not as difficult as you think– When we pray, it is easy to ask that God brings a miracle that will completely change the whole situation. We often wonder how God will resolve the conflict we are facing, and trust that He will, but also concoct complicated answers that we think will solve the problem. Then, we tell God these are the steps that need to be taken to implement the miracle. The answer is often easier than that…and it involves becoming uncomfortable and barreling through to victory. 3. Doing the right thing is always the best thing– This is hard to hear. It is also hard to understand sometimes. Many times, we truly do know what is right, but often it conflicts with what is easy. What is right may hurt feelings, or change lives…but the right thing will always lead to abundance. The wrong thing may feel better in the moment…it may even relieve some pain temporarily. It will never, however, lead you into the fullness of God’s plan. The right thing also will always be in line with God’s word. 4. You will never stray too far– There are people who do not follow God because of their anger, guilt, and shame. These feelings often come from a time of reflection on the person they have become and memories of a sin-filled past. Many think that they have sinned way too much for God to accept them…this is simply not true. God wants to meet you where you are at, and give you His abundant life now. Not after you clean up your act. He is waiting. 5. You will never get too close– If you have ever had a relationship in life that has truly let you down you know exactly what I am talking about. You know, you have loved someone and trusted them deeply and they turned around and used that power against you. Guess what. Your relationship with God is nothing like that, and it will never be that way. You can cultivate a close intimate relationship with Him and expose all of your flaws. He will accept you and use it to grow, stretch, and mold your life. It is about time you let go of the fear of getting close. 6. Wearing a T-shirt doesn’t count– If you really want to know what it means to be a follower of Christ…it has nothing to do with the cool new Christian T-shirt you just bought online. You may think you are telling satan to “shove it” when you wear it around town, but what you are really doing (sometimes) is trying to find a way to display the message without living it. This will not work. God wants you…not your clothing. Inanimate objects can not be spiritually redeemed. They have no soul. Now, when you wear that inspirational t-shirt…remember this…how can you truly be a walking billboard for the creator? Add things like compassion and forgiveness to the mix as well. These will go far. Your t-shirt will doesn’t count when talking about your Christian witness. God wants to say so much more to us. Don’t let a blog have to be the one to tell you.Open your ears, eyes, and heart. It is time to listen.